Throughout writing this blog, I have continually referred to the "Canonical Five" - Mary Ann Nichols, Annie Chapman, Elizabeth Stride, Catherine Eddowes and Mary Jane Kelly as being the victims most ripperologists agree were killed by Jack the Ripper. However, this is a fairly modern assessment and many other investigators would suggest that the actual murders he committed over the course of 1888 and the following three years, could be as staggeringly high as 12. 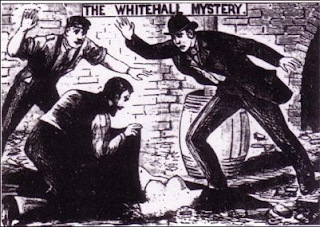 In fact, it is rather strange to think that although we often imagine Mary Ann Nichols to the be the first of the victims, the people of Whitechapel actually believed her to be the third at the time, following on from the stabbing murders of Martha Tabram and Emma Smith. In 1888, these killings are mentioned, but to keep things in the realm of the familiar, the story does not begin until the night of the Nichols slaying, and concludes with the morning of the Kelly murder. With the death of Mary Jane Kelly, we often imagine a sigh of relief being heard across the East End, but in truth, there would be a further five killings in and around the district before the murders finally stopped. In fact, there may have been another serial killer operating in London at the same time, and he, just like the Ripper, would never be caught. In one of the later chapters of the book, Gina and Aaron, who have taken to walking alongside the north bank of the Thames, find themselves stumbling out of the home of one mystery and inadvertently into another. On the morning of October 2nd, 1888, a builder working on the construction of the new Scotland Yard headquarters, made a grisly discovery. In the foundations of the building, tucked away in a closed vault and wrapped in paper and petticoats, he found the dismembered remains of a woman's torso. Police eventually matched the torso to a right arm and shoulder that had been found on the banks of the Thames in September of the same year. The police had not bothered investigating this initial find as (like so much concerned with the crimes of that year) it was dismissed as a prank by medical students. Police would later locate a left thigh near the scene of the construction site, but the remaining limbs and head were never found. The case was strikingly similar to another discovery which had occurred in May of 1887, when fishermen on the Thames found a bundle of cloths floating in the water. Upon hauling it aboard, they were horrified to realise it contained the torso of a woman. Over the following two months, limbs were found washed up along the shoreline of the river. Yet again, no head was ever found. It would be 1889 before another discovery was made. On June 4th 1889, just as the people of London were beginning to hope that the murders and mutilations that had blighted their city had come to an end, another torso was found washed up on the edge of the Thames, while more remains were discovered near Chelsea. On September 10th of the same year, on the first anniversary of the murder of Annie Chapman, another torso was discovered. Not in the Thames this time, but in the heart of Whitechapel. It had been left under a railway bridge on Pinchin Street and bloodied clothing was discovered in nearby Batty Street. All four of these murders demonstrated a similar level of medical skill. It often seemed as if the wounds had been tourniqueted to prevent excessive blood loss and some knowledge of surgical amputation was evident. Years previously, in 1884, 1874 and 1873, similar finds were washed up along the Thames. Nobody was ever arrested for these crimes and only one of these women was ever identified - a prostitute from the East End. With this flurry of violent crimes over a relatively brief space of time, it is easy to understand just how difficult it must have been to know where one cycle of violence began and another ended. The inclusion of the Thames Torso Murders in my novel was one way to help demonstrate that nobody at the time could have known who was responsible for which crime. It also helped to highlight another theme of my book. These unidentified women became a symbol of neglect and how in a city like London, it was possible to become so utterly forgotten that even your body would lose your identity. It seems we tread the same flags; although mainly a blogger I sometimes write fiction and the subject is endlessly, appallingly fascinating. I always had Joseph Barnett as the man myself. Access, motive (Not that any detective ever has cared a jot whether a killer has a motive or not) and opportunity combined with a familiarity to all of the victims. Oh, and a roll of knives on him for his work. It's only Joe... probably the last thought any of them had. Good luck with the work and I hope you solve the trunk case!.